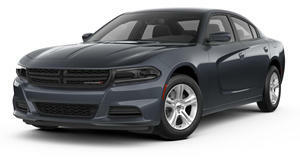 Latest package for the Dodge Charger combines all-wheel drive with a more aggressive attitude. Though it may have ruffled a few feathers among a certain breed of enthusiasts, Dodge did a smart thing when it applied the muscle-car formula to a four-door family sedan. The Charger gives suburban dads the kid-hauling capacity they need and the aggressive style they want. The Charger SRT8 is the most muscular of the range, and the Daytona is the most retro, but for those who need all-wheel traction, Dodge has just announced the Charger AWD Sport package. Available on the 3.6-liter V6 SXT or SXT Plus, and on the 5.7-liter V8 R/T and R/T Plus trim levels, the AWD Sport kit upgrades with such features as 19-inch alloys, a gloss black grille, a body-colored rear spoiler and a Sport setting for the eight-speed automatic transmission. Pricing runs at $1,395 when fitted to V6 models or $1,195 for the R/T version. Dodge only released a solitary (and poorly cropped) exterior shot of the Charger AWD Sport to go with the two interior images, so we&apos;ve added a couple of exterior shots of the SRT8 model for illustrative purposes.